How about New York at war – its skyscrapers blasted by cruise missiles, its intersections strewn with rubble, entire blocks blown to matchsticks by fuel-air bombs? 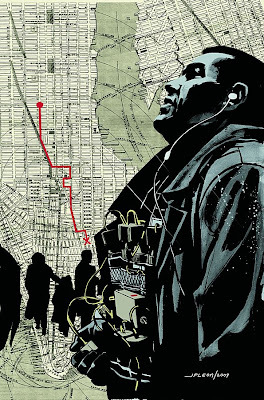 This is the big apple as envisioned by Brian Wood and Riccardo Burchielli in DMZ, a series of graphic novels that just released its 7th volume. Their America is ripped apart by a civil war between the libertarian, states-rightist Free States of America (FSA), and the cold, beauracratic Washington, D.C. government. NYC is become a Demilitarized Zone, and in the absence of government, its constituent neighborhoods protect themselves, feed themselves and eke out an existence among the roadside bombs. This is life during wartime. We here bash the ripped-from-the-headlines approach, in videogames especially (see Army of Two; Resident Evil 5); but contemporary doesn’t always mean gimmicky. The best topical art doesn’t reflect our world in theirs – mere refraction says nothing. DMZ is about the Iraq War. It takes the War on Terror and says: what if this happened to us? What if we were occupied? In the process, it speaks not only to what it means to be a New Yorker, but what it means to be American. Disclosure: I was born in Kingston, N.Y., but I never travelled to the city until I was 14 and living in rural Delaware. I’ve spent some time in the city, but not enough to know what it’s like to live there. Roth is a photo intern for a big-time journalist with Liberty News, the USA’s choice propaganda organ. His dad calls the shots in the upper echelons of Liberty, and pulled major strings to give his son the chance of a lifetime: he’ll be part of the first reporting team to enter the DMZ since the start of the war. Once on the ground, Roth’s team gets ambushed by a neighborhood militia. They shoot down his chopper and abduct the journalist. To cleanse the crash site, Liberty News drops a daisy cutter in downtown Manhattan, nearly nuking Roth in the process. He wakes in the apartment of Zee, a medical student turned neighborhood medic. Like it or not, Matty is now the only reporter in Manhattan. It’s the biggest story he’ll ever have – if he can survive it. Wood’s mouth is as filthy as Burchielli’s pen, and DMZ is dirty, moody and splendidly detailed , down to the graffiti on bombed-out housing projects. I page through these books often, and each time, I snag something new. Maybe Wood goes a little heavy on the cussin’, sounding on occasion more like a teenager out of paternal earshot than an authentic voice. Most of the time, though, he’s dead on, and his characters speak with due urgency and outrage. I said earlier that DMZ was a story about Iraq. You could break the different books into issues: “Public Works” deals with Trustwell, a sinister security contractor that tries to drum up business by instigating terrorism; “Friendly Fire” tells the story of a Hadaitha-type massacre; “Blood in the Game” charts the rise of Parco Delgado, a populist sensation who becomes the DMZ’s first sovereign leader (the voters get their thumbs dyed purple, as in Iraq). This could verge into a write-by-numbers recapitulation of yesterday’s headlines, but instead of being a rote history derivative, DMZ takes current events and turns them powerfully upon its readers. What if, it asks, this happened to us? What if New York City were Baghdad? This is where DMZ rises above mere transposition. A contemporary American Civil War is no stranger to the field of speculative fiction – see Orson Scott Card’s Empire of Shadow Complex fame. Most stories seem more interested in the new political topography than the human factor, which is incidental to the novelty of the scenario. DMZ keeps the political whatever in the background – the war’s history is shaded in flittingly throughout the series, never dwelled upon with the kind of exhaustive detail you’d expect from an armchair conspiracy-theoriest. DMZ is a love letter to New York City. All kinds of people in habit Manhattan’s various neighborhoods, which operate as fiefdoms unto themselves. The immigrant residents of Chinatown, forgotten in the evacuation, have fortified and work as a sort of mob; Central Park’s trees have been razed for fuel, and what few remains are guarded by the Ghosts, a cadre of castoff commandos who grow bamboo underground (it can be used for anything, their leader explains – food, fibers, wood, you name it). Uptown is essentially the wild west. Oh yeah, and Jersey is occupied by the FSA. In one of the series’ best vignettes, two rogue snipers carry on a romance across the river via whiteboards, winging a shot past the other’s head when they feel neglected. Vol. 5, The Hidden war, exemplifies what DMZ gets right. Five short stories poke into the dark nooks only hinted at before. In the first, a graffiti artist spends a decade tagging the roofs of subway cars; the first time he views his work in full is from the back hatch of a chopper, on his way to an internment camp (when parked at the Corona yard, all the cars line up to read “MINE” in big red letters). In another, an aspiring emcee gets caught up in a Trustwell-staged shootout at a nightclub. Wood could have stopped here and earned my loyalty. He went a little further, exploring Matty’s dilemma as a journalist. After two years in the DMZ, Roth has seen friends blown up, shot and buried under rubble. He hears the same excuses and watches the same peace efforts collapse time after time. A full-time resident, his objectivity starts to slip, and when Delgado comes around, he needs to choose sides – is he a journalist, or a New Yorker? Whereas DMZ could have easily been an exercise in what-if speculation, Wood and Burchielli exquisite attention to human detail give it the narrative girth of serious storytelling. Anyone who’s read The Watchmen doesn’t need to be told this, but forget what you knew about comic books. DMZ is better than good – it’s relevant.